Monday morning we drove along Desert View Drive, which meanders along the South Rim towards the east entrance to the park. On the way there are several spots where you either pull over to see the amazing view of the canyon right there, or turn off and take a short road to a view point. 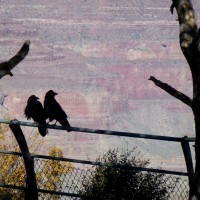 We pulled over to one place and a couple of crows seemed to have perched on a railing to also see the view. I guess they liked this one spot, though I imagine they could have flown anywhere they wanted.